What's wrong with upside-down Keynesianism? I've got a piece in today's WaPo focusing on how the tax cuts have broken an important, fiscal linkage between budget deficits and the strength of the economy. "When we close on full economic capacity, as is currently the case, tax revenues as a share of the economy should significantly rise, and deficits should fall. Instead, revenues have come way down, and deficits have climbed. Consider these numbers. Using data back to the mid-1940s, I calculated the average deficit as a share of GDP over every year since the late 1940s that the unemployment rate was lower than or equal to 4.5 percent (it's currently 3.7 percent). That average is -0.4 percent, as opposed to the -3.9 percent noted above for 2018. By the way, if I take this and last year's deficit (-3.5 percent) out of that average, the result is a small surplus (0.1 percent). This figure below shows this heretofore tight correlation between deficit and unemployment rate. To make the relationship easier to see, I've inverted the unemployment rate, so e.g., 4 becomes -4. 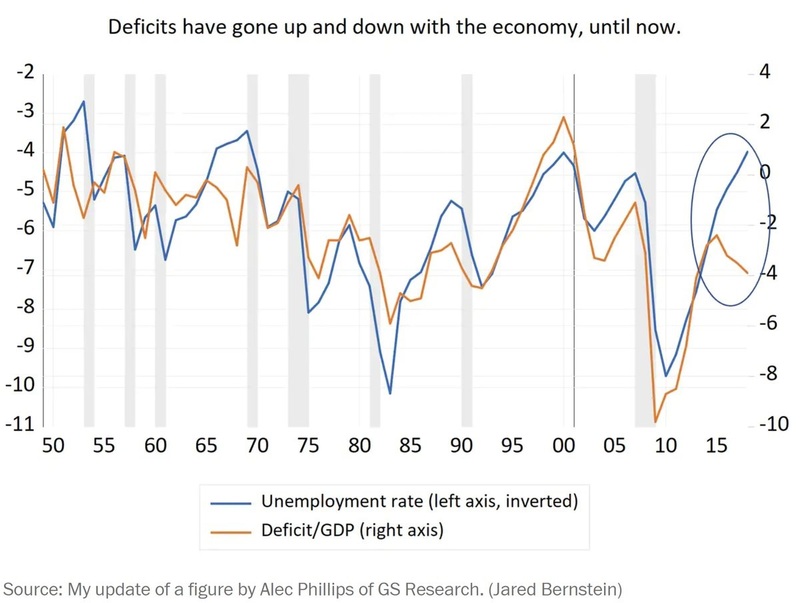 When the economy tightened up, deficits used to come down. But the circled area at the end of the figure shows that under today's fiscal policy that is no longer the case." You can see, in the circled part at the end of the figure, that the two lines were tracking each other as usual (meaning the economy was strengthening and the deficit was falling) but changed course in just the past few years. My WaPo piece gets into some details of how this relates to the tax cuts/spending increases and what should be done to rejoin the lines. But this piece is on the economics and political economy of what's going on in that circle at the end of the figure, what one might call "upside-down Keynesianism," (UDK) or stimulating an economy that's already closing in on full employment. Before I get into the analysis, however, in case there's anyone here unfamiliar with my rants of last year, I should clarify that this conversation abstracts from the fact that the Republican tax cut is a regressive, wasteful mess of tax complexity that is already exacerbating income and wealth inequality while opening up new loopholes that will promote tax avoidance and evasion until it is reversed. But this post isn't about that. It's about the macroeconomics of stimulating an already strong economy, not the composition of the stimulus. What are the upsides and downsides of UDK? The most obvious upside of UDK in the current economy is the extent to which the stimulus—deficit spending on tax cuts and spending programs—is pushing the economy closer to full capacity than would otherwise have occurred. In fact, there is both theoretical and empirical support for this upside. First, "secular stagnation" argues that structural factors—inequality, aging demographics, persistent trade deficits—prevent the U.S. (and other advanced economies) from achieving truly full employment absent a push from "non-market" sources, such as fiscal stimulus or accommodative monetary policy. The other theoretical support for UDK's upsides is that economists must admit that we do not know our stars (u*, y*, r*)—the economy's capacity indicators (the lowest unemployment rate consistent with stable prices, the level of potential GDP, the neutral interest rate)—within a policy-relevant confidence interval, and we've generally erred on the side of caution. Therefore, stimulus at alleged full employment can help achieve actual full employment. 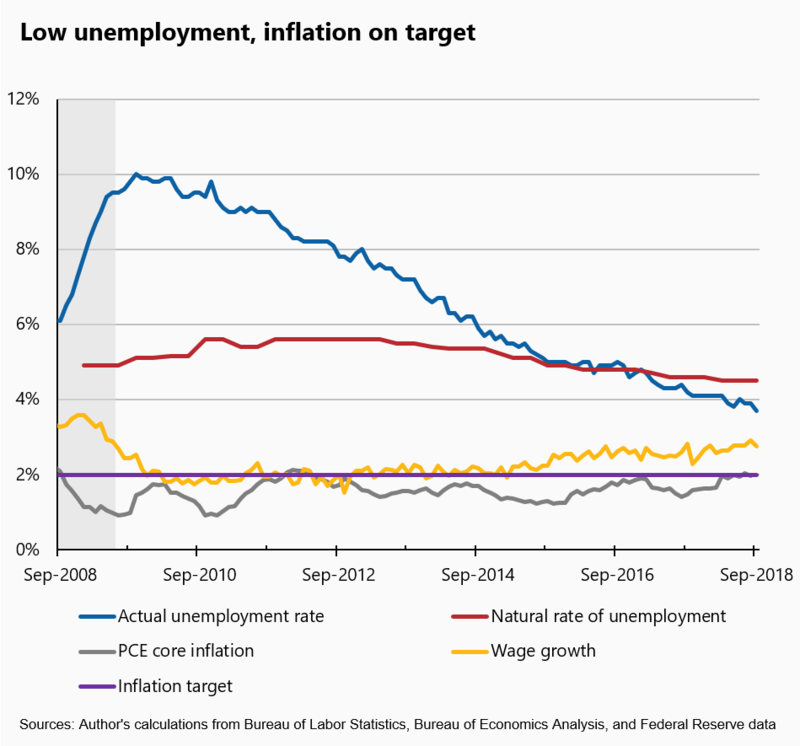 In fact, the next figure shows that as actual unemployment has fallen well below the Fed's estimates of u*, inflation is just now, after years of downside misses, hitting their 2 percent target (FWIW, I recently wrote up a related analysis which argues that their u* is about right; it's just that inflation is really well anchored; as far as UDK is concerned, the upside is the same). Empirically, even if we accept that standard estimates of u* (e.g.) are not too high, actual unemployment has been above the CBO's u* for two-thirds of the quarters since 1980. In other words, the U.S. labor market has been slack far more often than not, a huge market failure, a significant factor in weakening worker bargaining power over these years, and a strong case for pushing beyond conventional measures of full employment. The most obvious downside of UDK is overheating. Though the inflation line in the previous figure shows little evidence of such pressures so far, these dynamics can be non-linear, as long-dormant correlations can reawaken at high capacity levels. In their new World Outlook chapter assessing current risks, the IMF worries that since "the US economy [is] already operating above potential, expansionary fiscal policy could lead to an inflation surprise, which may trigger a faster-than-currently anticipated rise in US interest rates, a tightening of global financial conditions, and further US dollar appreciation, with potentially negative spillovers for the global economy." The IMF are worrywarts about such developments, but economist Dean Baker, with whom I frequently collaborate on ways to gin up more demand, is clearly not. Yet, even he recently said that "…we are likely getting close to full employment, so we probably don't want too much larger of a deficit." "Based on our aging demographics alone, we've long known that we will need more revenue over the next decade, not less. Add in geopolitical threats, climate change and the damage from increasingly intense storms (which is tied to the warmer climate), infrastructure, the need to push back on poverty and inequality, counter-cyclical fiscal policy that will be needed for the next downturn, and, it's not hard to understand why a rising deficit at full economic capacity is so ill-advised. That is, unless you're being paid not to understand these fiscal realities." In this regard, one of the biggest threats from the tax cuts that must be considered, even in the context of UDK, is the role it plays in emptying the Treasury's coffers so that Republicans can point to all that debt as a rationale for cutting social insurance and safety net programs. In this regard, UDK may be a misnomer, as Keynesian stimulus is by definition temporary and, though they made some of the their tax cuts temporary for budget scoring purposes, the advocates of the cuts want them to be permanent. And yet, if you look at any credible economic projection, you find that a Keynesian dynamic in the forecasts: as fiscal stimulus fades in late 2019, as shown in the next figure, GDP growth slows. 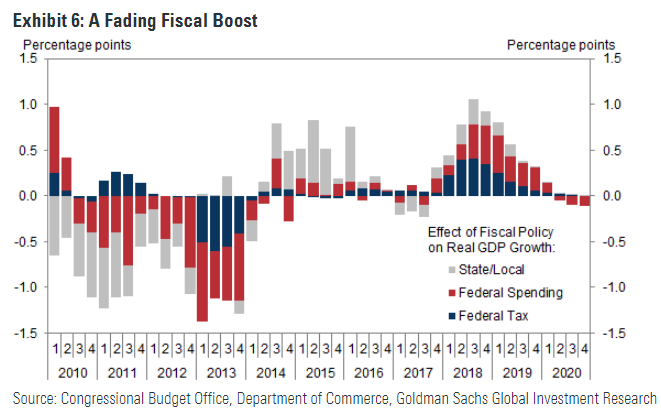 This expected reversal in fiscal impulse give rise to forecasts like that of the Fed which has real GDP up 3, 2.5, and 2 percent, 2018-20. Advocates of the tax cuts, however, view this forecast as wrong, as it discounts Laffer effects, wherein the cuts allegedly pump up supply-side variables—capital investment, productivity, labor supply—such that GDP moves to a permanently higher growth path (roughly 3 percent as opposed to 2 percent). In other words, barring another round of significant deficit spending, which, ftr, I would not rule out, in a few quarters we'll have a real-time, cage-match of Keynes v. Laffer. If GDP slows from its current underlying, short-term trend of around 3 percent to its pre-tax-cut trend closer to 2 percent, as the forecasts predict, Laffer loses…again. To be clear, as the WaPo piece argues, he and his disciples have already lost on the assertion that tax cuts pay for themselves, but that was never even remotely believable. There is, however, a wild card in play here, one I've written about under the rubric of the FEPM: the full employment productivity multiplier. This idea, for which there's suggestive evidence, is that in slack economies, firms can maintain profitability without being particularly efficient. At chock full employment, and especially with anchored inflation expectations, rising labor costs are a disciplining mechanism, enforcing the discovery of efficiency gains if firms are to maintain profit margins. These dynamics can also drive more capital investment that would not have been "necessary" in slack labor markets. Thus far we haven't seen much to suggest the "sugar-high" forecasts are wrong. Business investment is up, but no more than you'd expect at this point in the recovery. Productivity growth is still too low. Moreover, even if there is a productivity multiplier that gets tapped as we close in on full employment, it will be hard to assign victory to either side. In theory, Keynes wins again, as the capital investments in the FEPM model are not a function of the lower, after-tax cost of capital as much as a Keynesian accelerator story, where full-employment-driven job and wage gains fuel stronger consumer demand. In response to higher demand and the desire to maintain margins, firms ramp up their investment. But empirically, it will be hard to tell one story from the other. In sum, and abstracting from the awful regressivity, complexity, and aspiration permanence of the tax cuts, UDK has clear upsides. I don't think the unemployment would be as low as it is without it. The almost-50-year low in the jobless rate is finally starting to generate wage gains that will reach those who have heretofore been left behind in this expansion, even in year nine. It also invokes the risk of overheating. Yes, the Fed has lots of firepower to deal with that if need be, but the IMF could be right and we could end up with a hard versus a soft landing. But at the end of the day, my biggest concern is less about UDK and more that we're not really talking about temporary stimulus. We're talking about a permanent reduction in revenues, sought by hard-right conservatives who have been gunning for social insurance programs forever, and thus view this current strategy as a twofer to both enrich their donors while starving the Treasury.